High Recharge is Biotherm Homme's 1st double performance, non-stop anti fatigue moisturiser that combines active ingredients like Trace Elements, Mineral Salts and Pure Ginseng Extract, to instantly boost tired and dull skin types. It has been specially designed to immediately reduce the signs of fatigue, restore energy and leave the skin feeling continuously stronger. Pure Ginseng Extract - To instantly boost tired and dull skin types. Trace Elements & Mineral Salts - To supply minerals to the skin and improve circulation. Aspartic Acid, White Willow Extract & Vitamins B5 & C - Immediately reduce the signs of fatigue, restore energy. What a great product, smells fantastic and gives your skin a boost without having to use too much!!! I use this most days as a wee pick me up!! Bought this on a whim two years ago and have never been without it since. Light, smells citrus fresh and gives skin a wonderful healthy glow. First thing in the morning, after a heavy night or just before you hit the town. When your up for it and want a face to match, this is the stuff. Smells gorgeous......lifts your skin....great in the morning when your skin is feeling all dull...recommended. 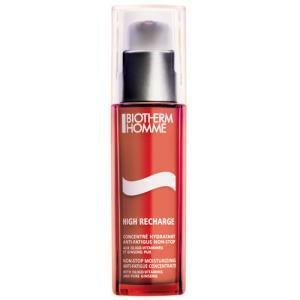 Biotherm High Recharge has a great texture and lovely fruity smell. It's definitely an excellent moisturiser and really does revive tired looking skin. I do tend to get a little shiny when I use it, so I only use it on special occasions, when my skin needs a little more moisture or just on my cheeks and neck which tend to by a little dryer. Biotherm High Recharge really did make my skin noticeably different with just one application, and as I don't use it every day, I notice the difference every time I do use it...my skin looks energised, brighter, and more youthful (like I remember it used to look 10 years ago). It's also fairly light and not greasy (I have oily skin so this is important to me in any skin product)...However, there's just something holding me back form giving it the full 5 stars, and I'm not sure I can quite put my finger on it...My skin is noticeably energised on my cheeks, but I don't see much difference on my forehead or nose or neck...I can't use it every day because, whilst it's light and non-greasy, my oily skin required something to actively address the grease and this is kinda irrelevant to that...it doesn't really do anything to combat blemishes...So I guess the thing preventing the full 5 stars is that its effects are a nice bonus, but kinda minor in importance in the grand scheme of things. Perhaps I will change my mind as I get older and the rejuvenating effect becomes more important to me, but somehow I'm not convinced yet.I find in terms of feel, Kiels Facial Fuel has a much better great zingy, energising feel that I really enjoy; though it doesn't produce as visibly youthful looking results as this. Grapefruit smell instantly wakes you up. Good moisturiser. Only problem is that it makes my skin shiny looking, thankfully the "Menaji Anti Shine Powder" helps with that! Not for everyday use due to the price, but ideal for a night out. Gives your face a bit of a pick me up but only very subtle. Will buy again when I run out. Biotherm High Recharge leaves me looking rather shiny unfortunately, although only on the forehead, which is possibly due to my oily skin. It does seem to be an excellent product though, and although it didn't 'energise my skin' or make me 'look refreshed', or younger, it is a good moisturiser, no doubt about that. This light-texture gel really perks up tired faces. I apply it in the morning and it banishes tiredness instantly; leaving a healthy, rosy glow. This product smells great and does moisturise effectively, but seemed to leave my skin looking a little irritated and red. Perhaps not for those with sensitive skin. Not the best product for my skin and rather pricey.